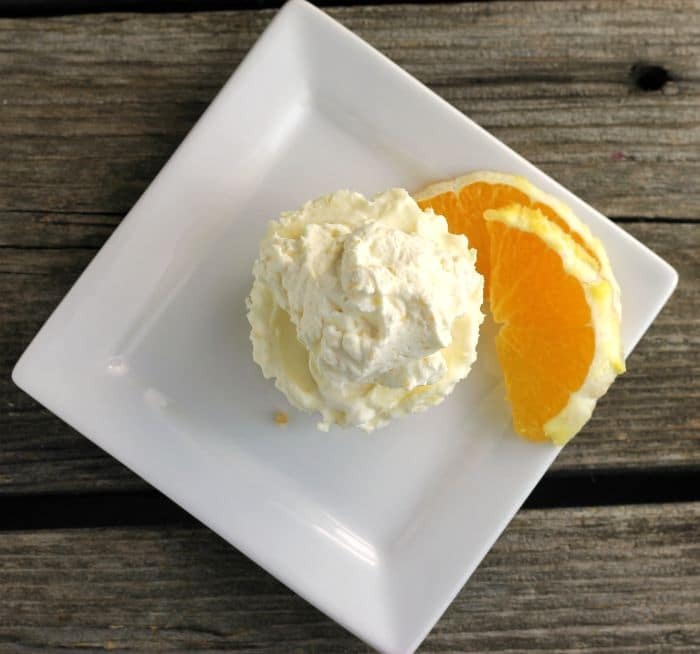 No Bake Orange Cheesecake, a no-fuss easy to make cheesecake, made with orange juice and orange zest for the flavoring and then topped with orange flavored whipped cream. 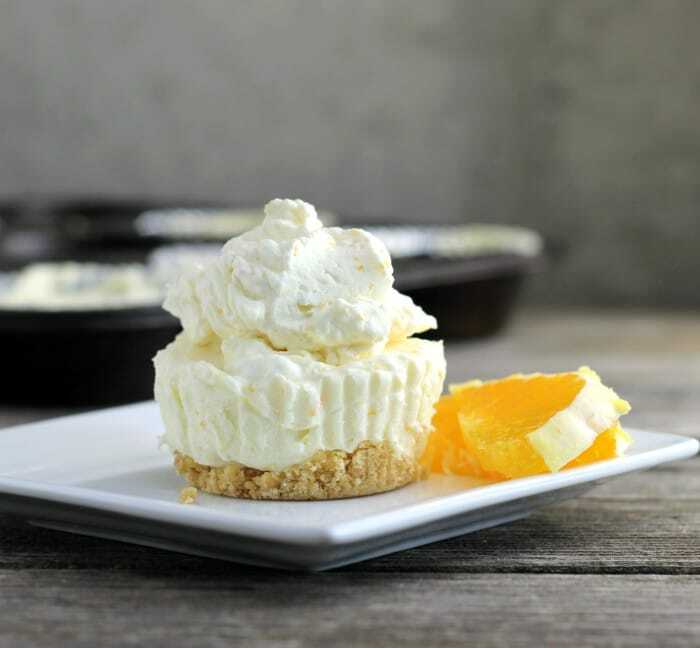 No bake orange cheesecake a delicious cheesecake that doesn’t involve baking at all. Perfect for this time of year when the citrus fruit is plentiful and delicious. Mike loves all things citrus, his favorite being orange. So I love to think of ways to incorporate orange flavor into desserts. If you look around on this blog you will be sure to find a few orange desserts. And, each time I make a new orange dessert Mike will declare that it is the best one I ever made. I think that it is funny how that goes. But to be truthful I fell in love with how delicious this recipe turns out. 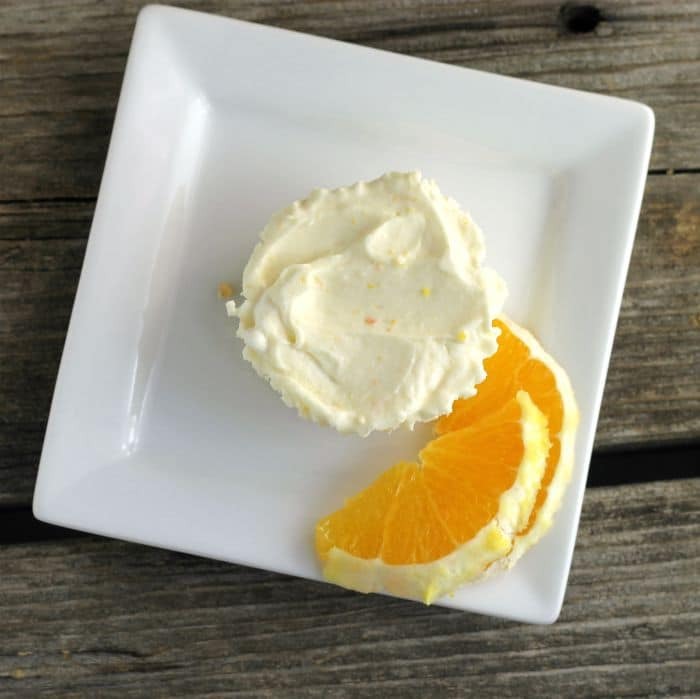 I decided to make this no bake orange cheesecake in muffin tins. Yeah, I love mini desserts and this was a perfect recipe for making in muffin tins. If you aren’t a fan of mini desserts feel free to put into a 9-inch springform pan. Oh, I almost forgot I like to serve these frozen. Everyone says that they remind them of an orange creamsicle. Either way, they are delicious. So Valentine’s Day is right around the corner, can you believe it? I know when you think of Valentine’s Day you normally think of chocolate. Well, it doesn’t always go that way in my house; I have a hubby that is not a real big fan of chocolate. 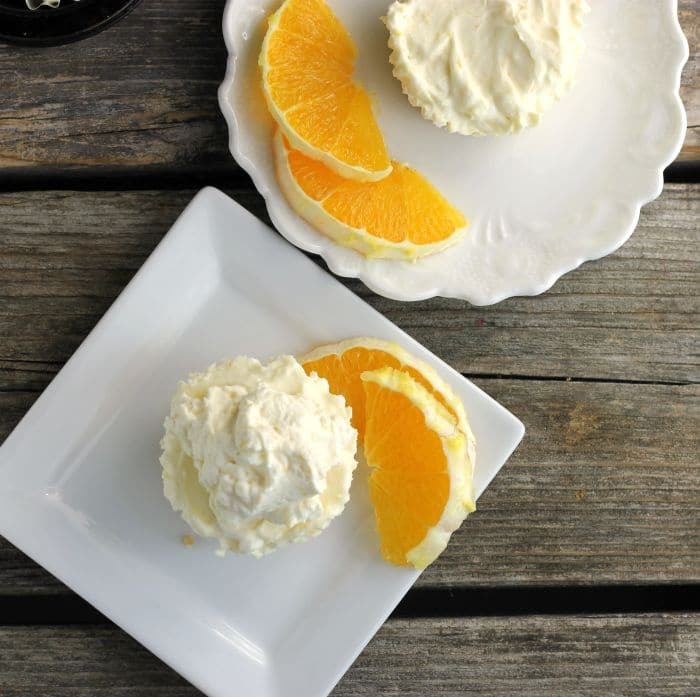 So I will be making this No Bake Orange Cheesecake for his Valentine’s Day dessert. Combine the crushed graham crackers with the sugar and mix until well combined. Add the melted butter and mix until the butter is mixed in. Divide among 18 muffin tins that have been line with paper liners. Press down with a glass to form the crust. Set aside. In a medium bowl beat the cream cheese with an electric mixer. Add the sugar and mix in. Add the orange zest and orange juice beat in. In a separate bowl beat the whipping cream with the electric mixer (make sure to clean the beaters before mixing the whipping cream). Beat until stiff peaks form. Add the whipped cream to the cream cheese mixture and fold in until well blended. Divide the filling between the 18 muffin tins. Freeze 3 to 4 hours. In a medium bowl add the whipping cream. Beat until soft peaks form Add the orange zest and powdered sugar continue to beat until stiff peaks form. I too prefer mini treats…easier for portion control and so much cuter too. These cheesecakes look beautiful and tasty, Dawn. I made a no-bake cheesecake last week—-I think that may have been my first ever! Loving your beautiful citrus version!